PRF is Platelet Rich Fibrin. 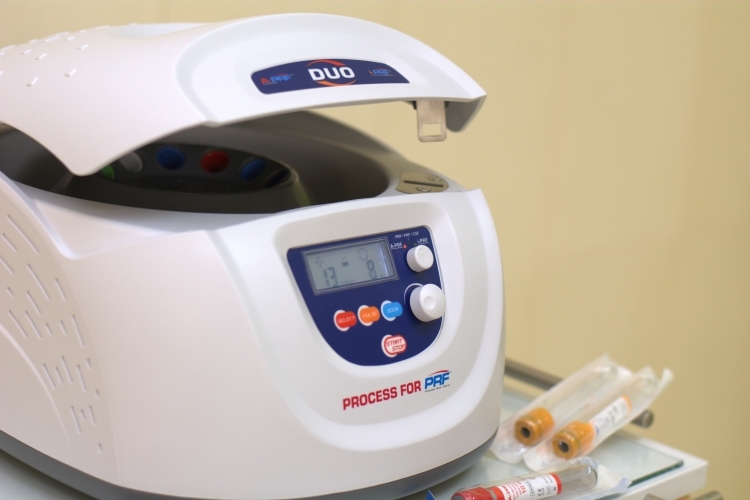 First of all, you need to know that PRF is obtained from the patient’s blood by processing it in a special centrifuge. Therefore, PRF is an auto material and no allergic or other adverse reactions are possible when it is introduced into the body. Besides, no additional agents are used to obtain PRF, except for a specific mode of blood processing in the device. In other words, this material is completely biocompatible with the body it was obtained from. The main components of i-PRF are platelets (blood cells). They feature a rich source of various growth factors that are necessary to renew other cells in the body. While the growth factors are contained inside platelets, they are unavailable for other cells. Therefore, it is very important to create conditions to make platelets deliver them. The larger amount of platelets, the greater number of FRs they can deliver and the more effective cell regeneration is achieved. Under the plasmolifting procedure, PRP (Platelets Reach Plasma) is obtained from the blood, by processing it in a centrifuge with addition of an anticoagulant agent. The end result of any regeneration procedure depends on the duration of growth factors release. When using PRP, they are released immediately, while PRF allows releasing them during 7 days. The growth factors’ lifetime after they are released from platelets is 3 minutes. Therefore, when using PRP, the body cells receive the regenerative growth factors only for a few minutes, while when using PRF, they get the factors continuously during 7 days, which provides better opportunities for the "tired cells" renewal. Essentially, I-PRF is an improved and much more effective method of plasma application (plasmolifting) to regenerate the body cells and it features a wider range of indications for use. Why to Have the Procedure Conducted in iStomatolog Center? we use so-called "clean" tubes that do not contain agents to prevent blood coagulation, and as the result, the plasma works up to 7 days at the injection site, enhancing the procedure effectiveness and allowing to reduce the number of visits and to increase a time interval between them. skin regeneration after aggressive methods of chemical and laser exfoliation. The procedure frequency is once in 3-4 weeks. The minimum amount is 2 times for acne treatment and averagely 4 times for rejuvenating effect. The course frequency (every 6 months or every 1-2 years) is determined taking into account the problem and age. contour plastic with a hyaluronic acid filler. 2 procedures of mesotherapy injections. hair growth activating and accelerating. As for the "head" plasmolifting, it is necessary to take into account that hair loss decreases in 2-3 weeks and returns to normal in 2 months. When treating hair loss, the result in the form of "new hairs" will be noticeable not earlier than in 8-9 months. The procedure frequency varies from 2 to 4 weeks. If necessary, plasmolifting of the hairy part of the head is conducted again – this depends on the initial situation and is determined individually in the process of treatment. in the complex therapy of periodontal diseases (laser treatment, ozone therapy, Vector-therapy). Plasmolifting is a right hand in dentistry, since it enhances natural restorative and protective functions. treatment of gingivitis and periodontitis - 1-2 procedures repeated once every 6-12 months. drink at least 1 liter of water 2-3 hours before the procedure. use of any beauty products (except for the care offered by a doctor) is allowed not earlier than in 3 days. slightly peeling skin is observed in 1-2 days. What to Choose: Revitalization, Biorevitalisation or Plasmolifting? It is necessary to understand that revitalization and biorevitalization are aimed at temporary cosmetic improvement of the skin condition. Under plasmolifting, our cells start working and regenerating more intensively, and the procedure effect is cumulative. Therefore, it is incorrect to compare the procedures, since they are different and not interchangeable. The cost of one i-PRF plasmolifting procedure depends on the area of application and the initial problem. You can find out the procedures cost and their necessary quantity at iStomatolog center.